The brand name Stahl is usually associated with cranes and electric hoisting systems; since the late 1800â€™s the name Stahl has been around, with its origins lying in Stuttgart, Germany. Since the late 1970â€™s Stahl has been expanding into the worldwide markets and is now a well recognised and respected company brand name. 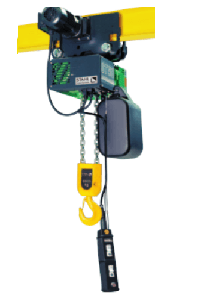 Stahl electric hoists are known for being modular systems; this enables them to supply hoisting systems with a range of non-standard layouts/designs; it also means that maintenance is relatively straight forwards as parts are easy to access. Lifting Hoists Direct are proud to be able to offer Stahl lifting hoists as well as servicing, maintenance, repairs and inspection services. Call us if you need more details.